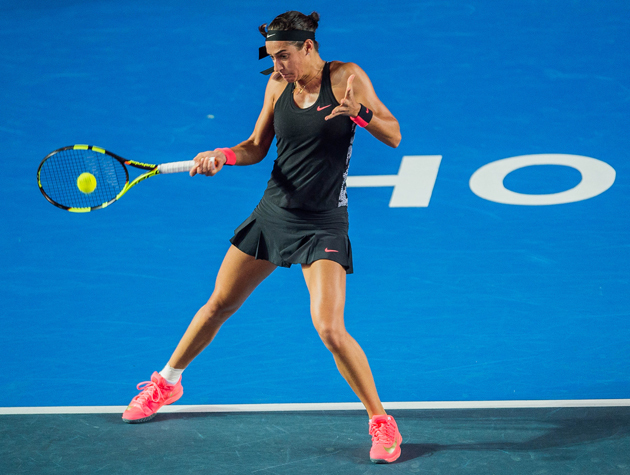 Caroline Garcia on traveling and more ahead of the WTA Finals in Singapore, where she has qualified with doubles partner Katarina Srebotnik and earned a fan vote for a spot in the WTA Rising Stars Invitational tournament. Like many, Caroline Garcia enjoys her mother’s cooking. But for the 22-year-old WTA rising star, that cooking takes place in apartments around the world as the French tennis pro trots the globe in search of ranking points and tournament victories. When she does arrive, Garcia, who routinely travels with her mom and dad, looks to land an apartment with a kitchen, making it “more like home.” It is there that her mom, Mary Lene, can shop and create the home-cooking environment. Safe and careful extends to her in-season practice regimen as well. With her father and coach Louis Paul, the pair spends most of their in-tournament time on site “getting ready for the match as much as you can.” For Garcia, the main practice comes in the offseason. Since she plays singles and doubles as much as possible, she’s zapping energy at a steady rate week after week. Missing her dog, Endy, doesn’t help either. Occasionally Endy will make a European trip with Garcia, but she knows that spending the day at a tennis tournament isn’t the best for a dog. Leaving for weeks on end is tough. “I miss her a lot,” she says. When Garcia lands in tournament-to-tournament mode, as she did in October with appearances at the China Open in Beijing and Hong Kong Open, ahead of the WTA Rising Stars Invitational tournament in Singapore, she says winning remains the most important thing to keep her focused. Garcia had her Asian swing extended when she won a WTA Rising Stars fan vote, giving her an extra tournament at the season-ending WTA Finals in Singapore. Garcia has also qualified as one of the top-eight doubles teams at the WTA Finals in Singapore with her partner Katarina Srebotnik​. For the 22-year-old, she’ll continue to balance that excitement of traveling the world with the need to focus on tennis. Maybe some of mom’s home cooking will help.